The workshop is targeted at clinicians, clinical virologists and nurses working in the public sector who are currently involved in the treatment of patients with HIV and TB in KwaZulu-Natal, South Africa. Click on the image below to access the website of the workshop. Organizers: Kogie Naidoo, Nesri Padayachi, Moherndran Archary & Tulio de Oliveira. 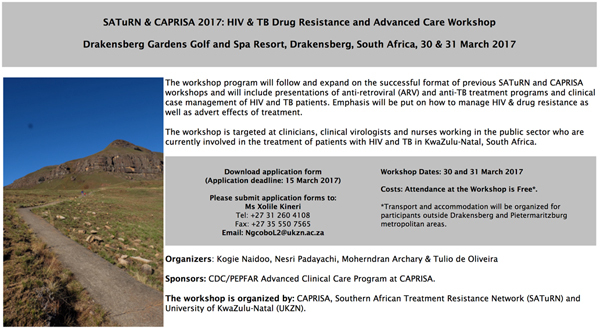 Sponsors: CDC/PEPFAR Advanced Clinical Care Program at CAPRISA. The workshop is organized by: CAPRISA, KRISP - KwaZulu-Natal Research Innovation and Sequencing Platform and the Southern African Treatment Resistance Network (SATuRN) and University of KwaZulu-Natal (UKZN).